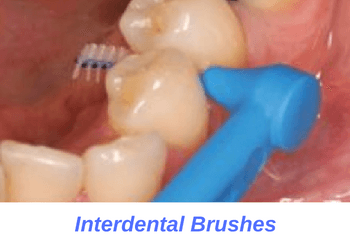 What is an interproximal cleaner? What are examples of different interproximal cleaning devices? Do I need to use an interproximal cleaner? Common examples of interproximal cleaners include the go-between toothbrush and rubber tips. 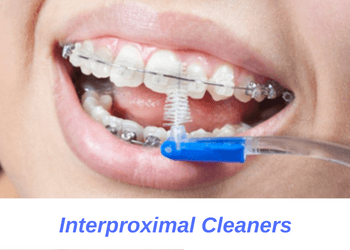 Interproximal cleaners are a series of oral hygiene devices designed to clean large gaps in-between your teeth. They are a great supplement for patients who have a hard time flossing their teeth or for whom flossing alone does not properly clean their teeth. Common examples of interproximal cleaners include the go-between toothbrush and rubber tips. You can purchase interproximal cleaners from your neighborhood pharmacy or buy them online. You can use interdental brushes to clean between crowns, bridges, dental implants or teeth with advanced bone loss. Interproximal brushes, or interdental brushes, are tiny brushes used to clean in between teeth. These brushes resemble a tiny toothbrush and are designed to go into small gaps. You can use interdental brushes to clean between crowns, bridges, dental implants or teeth with advanced bone loss. They can also be used to clean teeth with brackets or retainers on them. Rubber tips are great for cleaning in between teeth as well as stimulating blood flow. Rubber tips are similar to go-between brushes but they don’t have any bristles. Rubber tips are great for cleaning in between teeth as well as stimulating blood flow. Talk to your dentist to help decide which interproximal device is best suited to your needs. Alternatively, try them both to see which one works best for your needs. If you are suffering from advanced gum disease, then you’ve lost some of your supporting bone structure. As a result, there’s a good chance that you have large spaces in-between your teeth. This makes you a good candidate for using an interproximal cleaner to clean these larger gaps. If you have lots of existing dental work in your mouth then you’re also a good candidate fir using an interproximal cleaner. For example, if you have a mouth full of crowns, bridges or dental implants, then an interproximal cleaner could be your best friend. Interproximal cleaners are very effective at cleaning gaps under your bridges and implants as well as in between your crowns. Finally, interproximal cleaners can be used during traditional orthodontic treatment. Cleaning your teeth with brackets and wires on them can be difficult and challenging. Using an interproximal cleaner can help you clean your teeth better, especially since flossing is not a viable option during braces treatment. Talk to your orthodontist to see if they recommend using an interproximal brush during your braces treatment.